MicroStaffer features payroll check writing that can generate payroll checks directly from your scheduling data without any additional data entry and even comes with optional tax withholding tables that create W2 payroll. Choice of 1099 or W2 tax payroll with optional MicroStaffer Tax Engine. 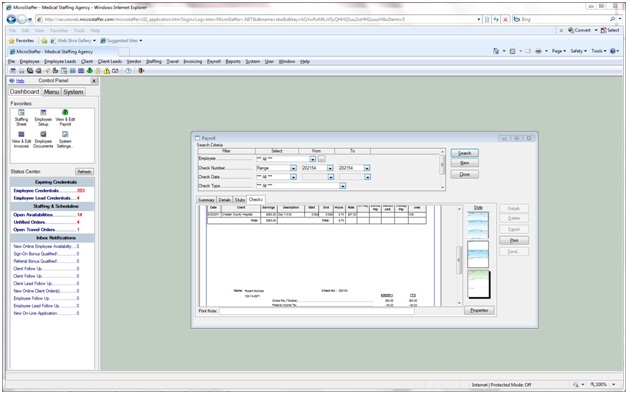 Batch or individual payroll processing. Daily pay and advance payroll including W2 advance payroll option. W2 Tax tables and ability to create custom payroll deductions. Direct Deposit ACH file creation. Daily and Weekly OT including tiered overtime rates (California). Custom time card export programming options. Integrated payroll and payroll tax reports.